For those keeping their eyes open, there was a welcome return in last week’s Superman #683 comic book (featuring 100,000 Kryptonians like Superman coming to earth) — non-white Kryptonians were clearly shown. Big deal? Well, kind of. By and large, superheroes are still the domain of the idealized white man (and woman). For the character's first 30 years, Superman’s homeworld of Krypton was all-white. It was only in 1971 —33 years after Superman's debut in 1938 — that the first non-white Kryptonian was seen. A few months later, the idea of non-white Kryptonians was expanded upon. Much like other mono-cultural planets of the Golden Age of science fiction, Krypton was a product of its time. “A lack of ethnicity was an eror of omission, and I'm not sure given the time that it's fair to call that ‘racist,’” Waid says. Superman creators Jerry Siegel and Joe Shuster, and all those who followed in crafting the Superman legend were, indeed, simply following the traditions of the Golden Age of Science Fiction, when one world always equaled one culture, maybe two if they were at war because the plot demanded it. Remember, as absurd as this sounds in an America finally enlightened enough to elect a black man as President, the Civil Rights Act wasn't passed until 1964. The gradual recognition of all races and ethnicities across all of pop culture, comics included, really didn't start to blossom until the late 1960s. Yes, Superman was weirdly late to that party — the first African-American even in a Superman story, and it's from the summer of 1970. But again, and not to make excuses, that delay was just creative inertia in action. After the start of a diverse Krypton in the early ‘70s, it was left up to creators and editors to make sure that Krypton was racially diverse, and it was occasionally shown to be — if the story allowed. Throughout its rather ignoble history, Vathlo Island remained undeveloped and unexplored by writers, which is both good and bad, probably. One interesting idea that was floated in the very brief mention of Vathlo in Krypton's history was that there was no slave trade on Krypton, which is why races didn't really mix — or at least why some of Jor-El's best friends weren't black. More often than not though, the planet of Superman’s birth has been shown to be made up of just one race, even in crowd scenes. As a quick aside, "Smallville," an alternate retelling of Clark Kent's younger years on The WB/CW has shown Nam-Ek, a Kryptonian equivalent of African-American. But with “New Krypton,” story architects Geoff Johns, James Robinson and Sterling Gates have been working to merge all aspects of Krypton that have been shown over the years, making all the visions and versions into a workable whole — including the fact that the planet was racially diverse — and hopefully without the segregation of Vathlo Island. 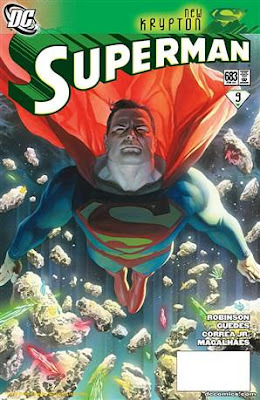 Here's hoping for a more colorful Krypton. This is cool as hell. Thanks for sharing.